Driving up the Gunflint Trail was like entering a new world. Moving further inland with each passing mile and leaving behind the warming effect of Lake Superior transformed the landscape into a snowy winter scene. I could forgive the trickiness of driving on a slick icy road for the benefit of the snow accumulations blanketing the woods. 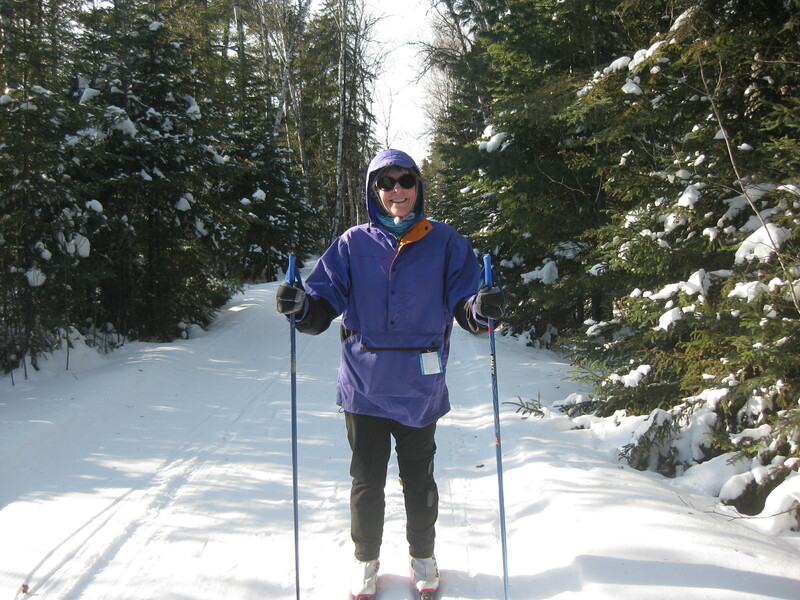 Susan and I were extremely grateful for having chosen to spend our annual XC Ski Weekend together staying at Poplar Creek Guesthouse on the central Gunflint ski trails. It was the perfect destination for a winter marred by lack of snow. For three full days we could leave behind the frustrations of barren brown ski trails and revel in the deep soft whiteness of beautifully groomed trails through the woods. I might have expected that the lure of good snow would draw crowds from the Cities to ski these trails over the weekend, but it certainly didn’t seem to be the case. Perhaps because the trail system is so extensive, we rarely saw another skier. In fact, evidence of wildlife was in far greater abundance. My favorite time out on the trails was early in the morning. Getting in at least 10k of fresh air and exercise makes the sumptuous and generous B&B breakfast all the more delicious. So I ventured out before light to ski through the pre-dawn stillness. 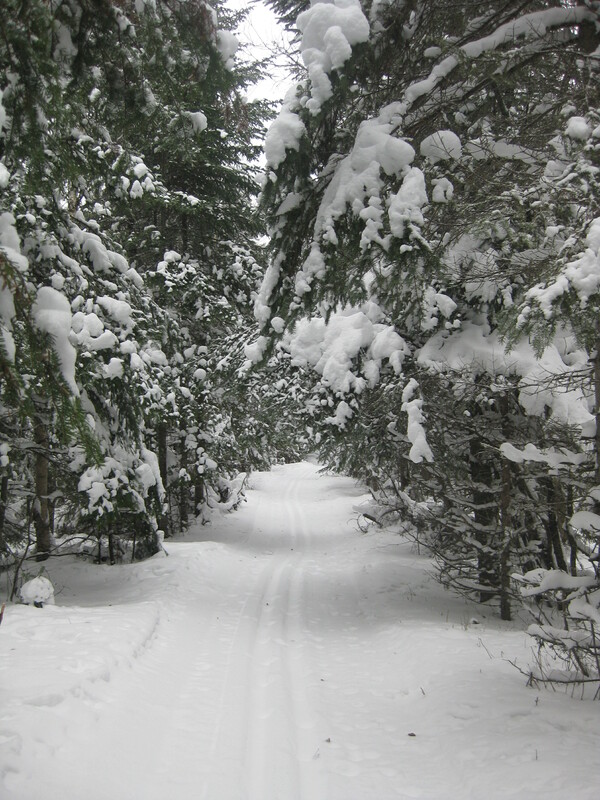 Each morning I was greeted by nearly an inch of new powder on the well groomed trails. It was the perfect carpet to record the previous night’s animal activity. I spotted plenty of bunny prints, watched a fox’s paws follow the ski tracks and wondered about the origins of other divots in the snow. But the best part was the musical accompaniment. Hearing something in the distance, I stopped skiing to silence the swish-swish of my skis. And there it was again. Howling. Bark-bark-bark-Oooooooh-bark-bark. Sometimes multiple Ooooooooohs in the middle. Over and over again. The song of the wolf was haunting and beautiful. And far enough away not to be a threat. We chose the Banadad Trail for one afterno on’s ski outing. Having done it before, we knew just what to expect – endless kilometers of narrow, single classic tracks through densely wooded forest with pine branches bending low under their burdens of snowy cover. Since it is largely flat with few turns and no intersections, it is the perfect opportunity to ski on autopilot and let one’s brain loose while drinking in the peaceful surroundings. We dubbed it a “contemplative ski.” It might have been completely serene had it not been for the moose tracks. 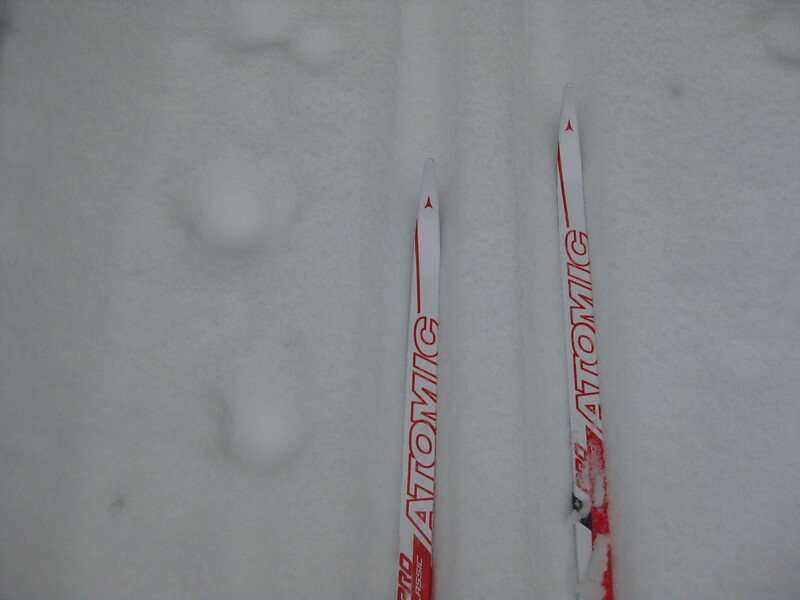 Most were made prior to the overnight snowfall, so although they trampled the ski tail, we felt reassured by the fact that the moose were long gone. Then we found the fresh tracks. Multiple moose chose to cross and follow the ski trail for a bit before wandering back into the woods. For all we knew, there were still there staring at us. But we never saw them. Susan was greatly relieved, by my camera-toting self was a wee bit disappointed. Lest all this sound too serious, we did have our moments of levity as well. Remembering our last ski on the Banadad when Susan missed the final turn to reach the Guesthouse, I stood sentinel to make sure it didn’t happen again. No point in delaying our evening wine and cheese, after all. It was three glorious days of cross-country skiing at its best – soft snow, endless views of an undisturbed natural environment and evidence of furry friends playing on the trails. There’s nothing better than skiing with Mother Nature. 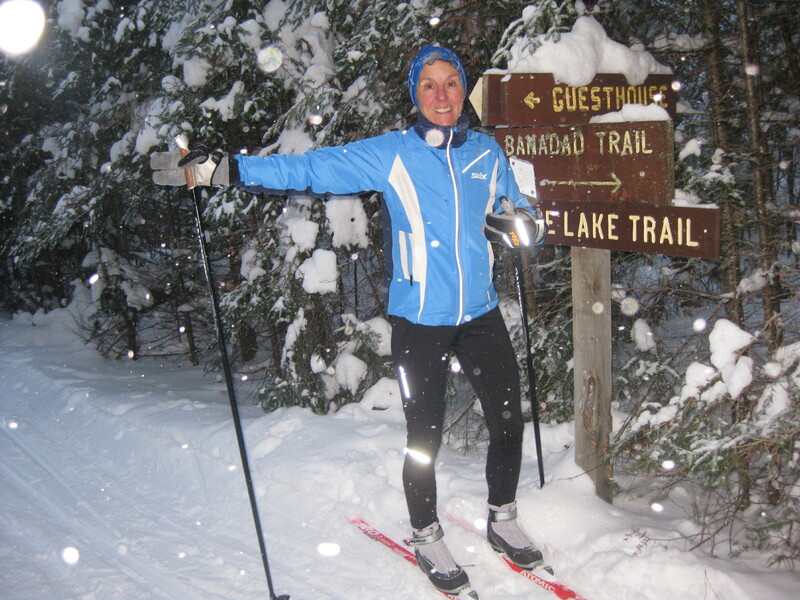 This entry was posted in Keeping Fit, Outdoors and tagged Cross-Country Skiing, Gunflint Trail, Outdoors, Snow by Molly. Bookmark the permalink.